Texas Democrats are running competitive candidates in a number of state House races currently held by Republicans. But a handful of deep-pocketed sources are helping Republicans outraise their opponents in many of those races, even in districts that Democrats view as likely pickups, according to a Texas Tribune review of campaign finance records in a dozen state House races widely considered the most competitive. Groups like Empower Texans, the hard-line conservative group, and the powerful business group Texans for Lawsuit Reform are spending in a way that could provide a boost in the GOP’s fight to retain some of the most vulnerable of its 95 seats in the 150-member lower chamber. Two political action committees affiliated with Empower Texans that are mainly funded by Midland oilman Tim Dunn and West Texas fracking billionaires Farris and Jo Ann Wilks combined to dish out roughly $1.2 million between July 1 through Sept. 27 in donations, advertising and consulting. That money helped bankroll campaigns for state Rep. Matt Rinaldi, R-Irving, and a few other GOP candidates locked in tight elections for state office. In Rinaldi’s North Texas race, $200,000 of the $278,000 the incumbent received over the summer, campaign finance reports show, came from Empower Texans PAC and Texans for Fiscal Responsibility PAC, the other entity tied with the group. That boost helped Rinaldi handily outraise his Democratic opponent, Julie Johnson, who hauled $188,000 — a figure that included big-dollar in-kind contributions from Annie’s List and Texans for Insurance Reform. Rinaldi has drawn the ire of Democrats for some of his hard-line conservative stances — and his district is nestled in Dallas County, which, thanks to changing demographics and Democratic enthusiasm, is home to a hotbed of competitive state House races this year. Most of the money shelled out by GOP-aligned groups over the summer went toward playing defense. In a campaign season in which Democratic energy is high, there aren’t many seats viewed as pick-up opportunities for Republicans. Mark Jones, a political scientist at Rice University, suggested that’s partly because the GOP has nearly maxed out the number of seats the party can realistically hold with the current state House map. “Republicans have already picked up almost all the low hanging fruit,” Jones said. Still, keeping as many seats as possible is especially important to Republicans this year, since the makeup of the lower chamber will impact the looming race for the next House speaker. One Democrat who Republicans have heavily targeted this year is state Rep. Victoria Neave of Dallas, whose Republican opponent Deanna Maria Metzger received $60,000 in combined help from Empower Texans PAC and Texans for Fiscal Responsibility PAC, along with a nearly $20,000 non-monetary political contribution from Gov. Greg Abbott’s campaign — which was also generous with its resources over the summer. Neave flipped the district for the Democrats in 2016, but her re-election bid has been complicated by her 2017 arrest for driving while intoxicated. In October 2017, Neave pleaded no contest to the crime, paid a fine and went on probation for 12 months. She is among the handful of Democrats running for the state House in the most competitive races who raised more than their Republican opponents in the most recent period. Out of the races the Tribune examined, two Democrats vying for open seats currently held by Republicans also reported fundraising advantages — John Turner, who’s gunning for a Dallas-area seat being vacated by GOP state Rep. Jason Villalba of Dallas, and James Talarico, who’s competing for a Central Texas seat to replace retiring state Rep. Larry Gonzales, R-Round Rock. Republicans were the top fundraisers — non-monetary contributions included — in the other nine races the Tribune reviewed. Neave raked in $172,000 over the period to Metzger’s $112,000, and ended the period with a huge cash advantage. Neave received around $30,000 from the House Democratic Campaign Committee and over $10,000 in non-monetary political contributions from Annie's List for survey research, among other things. In the open race to replace outgoing state Rep. Cindy Burkett, R-Sunnyvale, Republican Jonathan Boos vastly outraised Democrat Rhetta Bowers, $222,000 to $75,000. Boos received $90,000 from Empower Texans PAC and Texans for Fiscal Responsibility PAC, while Bowers received a $12,500 non-monetary political contribution from Annie’s List for survey research, plus $5,500 in donations from the group. Boos also received $25,000 from Texans for Lawsuit Reform PAC, plus almost $40,000 in non-monetary political contributions from the group for grassroots canvassing, polling and more. 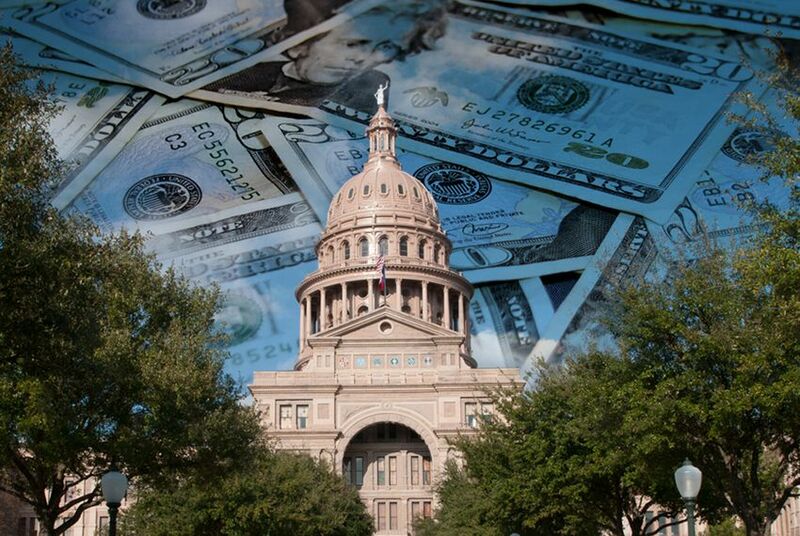 Texans for Lawsuit Reform PAC doled out roughly $1.4 million on advertising, donations, polling and consulting for Republicans in various races between July 1 through Sept. 27, campaign finance reports show. To be clear, Democrats also raked in sizable amounts of cash — and state Rep. Chris Turner of Grand Prairie, who heads the party’s caucus in the House, said he wasn’t bothered by the fact that a majority of his party’s candidates locked in competitive races were outraised over the summer. A big chunk of help that Democrats in these competitive races received over the period came from Annie’s List, Lone Star Project, a progressive group, and the House Democratic Campaign Committee PAC, which recently received a $250,000 lift from a national redistricting group headed by former U.S. Attorney General Eric Holder. Annie’s List handed out around $131,000 in advertising, donations, polling and consulting between July 1 through Sept. 27, Lone Star Project doled out roughly $237,000 and the House Democratic Campaign Committee PAC spent about $76,000. Early voting in Texas begins Oct. 22. And Election Day is Nov. 6. Disclosure: Rice University, Texans for Lawsuit Reform and Annie's List have been financial supporters of the Tribune, a nonprofit, nonpartisan news organization that is funded in part by donations from members, foundations and corporate sponsors. Financial supporters play no role in the Tribune's journalism. Find a complete list of them here.